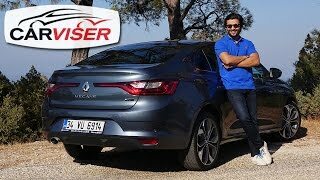 Renault Megane is no new name in the hatchback segment. The model from the house of Renault has been rolling dices since 1995. Moving the legacy ahead, in the year 2015 company unveiled its all new Renault Megane 2016. Carrying stunning design and innovative interior the model has impeccably gained eyeballs at the 2015 Frankfurt Auto Show. Let us have a descriptive look at the review of Renault Megane 2016 to know more about its specifications and performance figures. The interior of Renault Megane 2016 might recall you the recent in-house unveil Talisman 2016. Just like it the model features a massive touchscreen display that covers almost the entire center console. Apart from this high-end materials have been used in covering the interior, which won’t just give you soft touch experience but the chrome trim will add to the luxurious looks. Talking about the technological upgrades, model gets adorned with the latest features. This includes color head-up display, instrument cluster that has seven-inch TFT display and a massive 8.7 in touchscreen allowing you remarkable experience of infotainment and entertainment. 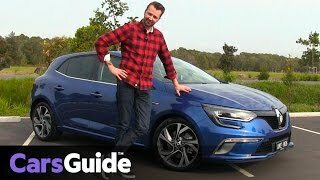 In all the interior of Renault Megane 2016 is undoubtedly way ahead of its predecessors. The exterior of Renault Megane 2016 undoubtedly portrays the traits of how a hot hatchback should look like. Starting with the front fascia, it has a new Renault signature grille sitting amidst the C-shaped LED headlights. The hood features sharp creases and chrome trim at the end, marking presence over the newly designed grille while the bumper gets more aggressive with its new design. Moving towards the rear fascia, you will notice the chrome trim work extending its pathway till the side panels and the door handles while the rear end has newly designed LED tail lights that make the model look distinct. The exterior of car comes dipped in various color options, out of which the newer one is the mesmerizing (my personal opinion) ‘Iron Blue’. 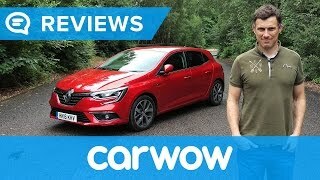 Rounding up the exterior details of Renault Megane 2016 I would say it looks simply stunning rolling over the 18” aluminum wheels and remarkable spreads the aggression with those dual chrome exhausts mounted at the rear end. 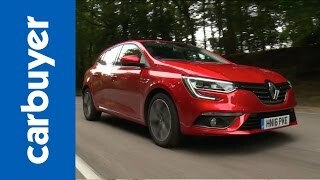 Powering the new Renault Megane 2016 are six engine options that will be offering total output from 90 hp to 205 hp. Though nothing much has been disclosed in this context but we do fetched out that out of these six, three will be diesel while another half will be gasoline engines. 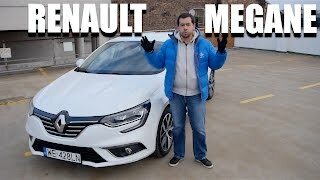 Rather than guessing the performance figures of the Renault Megane 2016 we would prefer waiting for the company’s unveil as we do have lot of expectations from all of the six drivetrain options available.